Pisces is the 14th largest constellation but its stars are relatively faint. Pisces, named for the Latin plural of fish, occupies 889 square degrees, making it the 14th largest constellation overall. While it is a fairly large constellation, its stars are faint — none are brighter than fourth magnitude — making it challenging to see in the sky with the naked eye. Pisces is notable for containing the point at which the sun crosses the celestial equator into the Northern Hemisphere around March 20 each year. This point, called the vernal equinox, used to lie in Aries, but has moved into Pisces because of the Earth's wobble on its axis, called precession, according to astronomer and author Ian Ridpath. Pisces is in the first quadrant of the Northern Hemisphere and covers a large V-shaped region. Its large area, coupled with its dim stars, makes it hard to pick out in the night sky. Northern Hemisphere observers are able to see Pisces most clearly in early autumn. Visible: Between latitudes 90 degrees and minus 65 degrees. Best viewed: at 9 p.m. between Nov. 6 and Nov. 9. Pisces is located northeast of Aquarius and to the northwest of the constellation Cetus the Sea-monster. Other constellations bordering Pisces are Triangulum, Andromeda, Pegasus and Aries. One of the key ways to identify Pisces is to find the Circlet of Pisces — also known as the head of the Western Fish — to the south of the Square of Pegasus. The Eastern Fish can be seen leaping upward to the east of the Square of Pegasus. 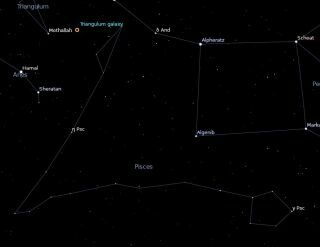 Eta Piscium, also known as Alpherg or Kullat Nunu, is Pisces’ brightest star. It is a bright giant star (G class) that is 294 light-years from Earth and has a luminosity that is 316 times that of the sun. The constellation’s second brightest star is a yellow giant about 130 light-years from Earth known as Gamma Piscium. Alpha Piscium is the third brightest star in Pisces and is made up of a pair of white dwarf stars in close proximity. It is also called Alrescha ("the cord") as it illuminates the spot where it appears that the tails of the two fish are tied together. Also known as Fum al Samakah, Arabic for “mouth of the fish,” Beta Piscium has a magnitude of 4.53 and is about 492 light-years from Earth. Pisces also boasts Van Maanen’s Star, named for Adrian van Maanen, the Dutch astronomer who discovered it in 1917. It is the 31st closest star system and the nearest single white dwarf to the sun, at just 14.1 light-years away. Pisces also contains a Messier object — which are galaxies, nebulae and star clusters recorded by 18th Century French astronomer Charles Messier. Messier 74 is a spiral galaxy located between the stars alpha Arietis and eta Piscium. The Hubble Space Telescope imaged a pair of bizarre galaxies, called Pisces A and Pisces B, in 2014. Two years later, researchers announced that data from those observations showed the dwarf galaxies used to be by themselves, but over time they moved to a nearby group of galaxies — a process that accelerated star formation. Researchers said the study of Pisces A and Pisces B can also shed light on what dwarf galaxies today may have looked like in the ancient past. Researchers looking at the galaxy NGC 660 announced a huge explosion there in 2013, which likely came from a black hole. They ruled out a supernova (star explosion) event as the researchers saw five locations with bright radio emissions near the galaxy's core. "The most likely explanation is that there are jets coming from the core, but they are precessing, or wobbling, and the hot spots we see are where the jets slammed into the material near the galaxy's nucleus," stated Chris Salter of the Arecibo Observatory. Several exoplanets have also been found in the constellation. In 2014, researchers found a world called GU Pisces b that orbits an incredible 2,000 times the Earth-sun distance, which means the planet takes roughly 80,000 Earth years to go around its star once. The Kepler space telescope, when it started its new observing mission in later that year, discovered a super-Earth called HIP 116454b about 180 light-years from Earth. A Search for Extraterrestrial Intelligence (SETI) probe examined HIP 116454b for signals the next year, but the search turned up empty. In the sky, Pisces is represented as two fish swimming at right angles to each other, one to the north and one to the west. They are attached by a cord. The fish themselves are apparently the Greek goddess Aphrodite and her son, Eros, who turned into fish and jumped into the Euphrates River to evade the fiery breath of the monster Typhon, "the most awful monster the world had ever seen," according to Ridpath. In astrology, which is not a science, Pisces is the 12th sign in the Zodiac and represents those born between Feb. 20 and March 20.